President Abdulla Yameen has appointed chancellors to the newly established Maldives Islamic University (MIU) as well as the Maldives National University (MNU). Former MNU chancellor Dr Mohamed Zahir Hussain was appointed the the MIU’s first chancellor while Civil Service Commission (CSC) chairperson Dr Mohamed Latheef was appointed the new MNU chancellor. President Yameen also appointed Dr Ali Fawaz Shareef as the vice chancellor of the national university. Zahir Hussain is the chairman of newspaper Haveeru and had served as education minister for 11 years during the 30-year reign of former President Maumoon Abdul Gayoom. He was appointed MNU chancellor in March 2012 following the resignation of former chancellor Dr Musthafa Luthfy in protest against the transfer of presidential power the previous month. Today’s appointments follow the ratification of a first amendment to the Maldives Islamic University Act on Thursday. The new law passed in April was due to come into force in August, but the first amendment fast-tracked the process of upgrading the Islamic College of Maldives or Kulliya to a university and required the president to appoint a chancellor. Kulliya was officially declared an Islamic university on Thursday. The appointment of a new MNU chancellor meanwhile follows ratification of amendments to the Maldives National University Act last week, which authorised the president to appoint nine members to the 13-member governing council, including the chancellor and the vice chancellor. The president could previously only appoint the chancellor. The main opposition Maldivian Democratic Party had warned that the changes will compromise the MNU’s independence and politicise the institution. The Maldivian Democratic Party’s (MDP) education committee has expressed concern over rising government interference with educational institutions. The committee has condemned the recent decision by the government to vacate the old Jamaaluhdheen Building, currently the location for Maldives National University’s (MNU) faculty of arts and other departments, catering for over 1,300 students. “The students are all scared. They have been hearing that police are going to come and vacate the building. Even the student union has demanded answers as to where these facilities will be transferred,” said the MDP Education Committee chair Dr Musthafa Luthfee. Media have reported that the President’s Office has requested the police vacate the old Jamaaludheen premises within seven days, prompting concerned responses from the university and the student union. The President’s Office was not responding to calls at the time of publication. “These students are unsure as to whether they could return to their classrooms they have been studying in,” said Dr Luthfee, who served as the minister of education during MDP’s administration. An MNU statement released yesterday read that the sudden decision to vacate the premises is not viable without a building to move to, and that the university is saddened by the fact that the decision will halt the education of many students. While the Maldives Police Services refused to comment, the President’s Office told media that the university was offered several other plots of land to move the faculties and that the government wants to vacate the premises due to safety concerns. The MDP education committee also raised the issue of the private higher educational institute, Mandhu College, which was handed a 15 day eviction notice by the Ministry of Education earlier this month after the it claimed the college had breached the terms of its lease. Mandhu revealed yesterday (February 10) that large number of students who have started courses at the college have started dropping out. Also speaking at the press conference today, committee member Shifa Mohamed criticised the education ministry for intimidating teachers and putting them in humiliating circumstances. “On one side the teachers are being told to go study and improve their quality, while on the other side they are being intimidated,” said Shifa. The committee had previously alleged that the structure of the recently announced salary increments for teachers was poorly planned and researched, and that it would leave a lot of teachers who do not fall into the criteria at a loss. While the Teacher’s Association of Maldives (TAM) have also pointed out the weakness within the structure of the salary increments, its president Athif Abdul Hakim has accused the government of intimidation for speaking out against the new pay scales. Athif told Minivan News that a letter of warning had been handed to him today by the head of Dhivehi Department at Majeedhihyaa School – where he works as a Dhivehi teacher – demanding he clarify in writing some of the comments he has made in the media. Athif had previously said that he had been summoned to the education ministry and told by the Permanent Secretary Dr Abdul Muhsin to “pay attention to public interest” while speaking publicly about the teachers structure. The Maldives National University (MNU) has provided grants worth MVR2.7 million (US$175,097) at a ceremony this morning to five individuals to conduct research. The research projects include a study of renewable energy in the Maldives by Faculty of Engineering’s Dean Dr Muaviath Mohamed, and a study to monitor air pollution in the capital by Dr Mizna Mohamed from the post-graduate research centre. Dr Nashia Mohamed from the Faculty of Arts received a grant to study the effect of foreign languages, while studies on distance learning by Roza Ibrahim from the Centre for Open Learning, on growing capsicum using hydroponics in Laamu Gan, and on improving teacher training all received funding. A special committee was formed by the university to oversee the research grant scheme. The committee reportedly evaluated eight proposals and considered potential benefits to the nation. MNU Deputy Vice Chancellor Dr Ali Shareef – chair of the evaluation committee – said at today’s ceremony that the university plans to provide further grants and invited interested parties to submit proposals. The Maldives National University has announced that it will be providing English language classes will be held for students in preschool and primary grades. The programme will start today (July 2) and is scheduled to end on July 24. The classes for primary grades will include writing, listening and speaking skills in the English language. The preschool sessions are based on the UK brand ‘City and Guild Intensive English Language Programme’. The entry fee for the programme is MRV750 per student and classes will be held for a duration of four hours every weekday. The Ministry of Environment and Energy yesterday (April 1) held a panel discussion as well as a question and answer session to mark the occasion of the World Water Day 2013, which fell on March 22. According to the press statement, the presentations covered a range of topics from water and energy, the history of water and sewerage systems in Maldives, the current plans and policies of the government including summary information on projects, meteorological aspects related to water security, water as a human right, issues related to water quality, and how water is related to climate change. The event was held mainly for the students studying environmental management, journalism, and teaching at the Maldives National University (MNU). Their participation was intended to enrich their knowledge and to orient them towards environmental issues in Maldives, the ministry’s press release stated. The event was held in association with the Faculty of Science at MNU, with a welcome address given by the Deputy Vice Chancellor for Academic Affairs Dr Ali Shareef, followed by the speech by the State Minister for Environment and Energy Hasan Shah. Minister of State for Environment and Energy Abdul Matheen Mohamed has previously told Minivan News that the government is emphasising integrated systems in order to make the best use of the water resources currently available in the country. The Maldives National University (MNU) announced the establishment of its Postgraduate Research Centre and strategic plan for 2013-2017. The centre was inaugurated by President Waheed Hassan Manik in the university’s auditorium. During the ceremony, Waheed announced a plan to introduce a Presidential Postgraduate Research Fellowship, however due to the lack of funds, only one fellowship is currently being established, reports local media. Waheed urged that the knowledge spread by the university “does not contradict the principles of our country, religion, nationhood and culture”. The Housing Ministry has sent a seven day notice to the Maldives National University (MNU) to vacate the old Jamaaluddeen School building, which houses the university’s Faculty of Sharia and Law (FSL), Faculty of Arts (FA) and Centre of Continuing Education (CCED). Speaking during a press conference on Thursday, Housing Minister Mohamed Muiz said the notice was given following a cabinet decision on the matter. He added that the Attorney General had also advised the government in favor of the decision. “The building that the National University is currently using is very old and no longer safe to carry out any activity. That is why I submitted the matter to the cabinet,” he said. Muiz said the building should be vacated immediately as it was unsafe for students to study there. “The government will not be responsible for any damages incurred by students, lecturers or anyone who uses the building. We have told them to vacate the building and remove their property as well,” he said. Muiz said his ministry had repeatedly requested the MNU Council vacate the building, even after another building was shown to them. Minister Muiz claimed that the government intends to demolish the building as soon as possible after MNU vacates it. Speaking to Minivan News, Deputy Vice Chancellor of Maldives National University Dr Fayyaz Ali Manik confirmed that the university had received the letter from Housing Ministry. “We have received the letter. However, it is not a very easy decision to make. We don’t have any choice but to stay in this building,” he said. Fayyaz said the University had requested the government find an alternative venue to house the faculties that are currently in old Jamaaluddeen building, and denied claims by the Housing Minister that alternative premises were offered to the National University. “We have not been given any other building. They never mentioned it,” he said. Fayyaz reiterated that a final decision on whether to move should be decided by the university council. “I think we got the letter this afternoon. So it would be up to the university council to decide on the matter. The council includes people who are not currently working in the university. So it may take some time to decide the matter,” he explained. Speaking to Minivan News, President of the Law Students Society (LSS) Student association of Faculty of Sharia and Law, Mauroof Ahmed, said the students were very concerned about the issue as it directly affected their studies. “This morning we got the news that the Housing Ministry has ordered MNU to leave this premises within seven days, and if the university fails to do so, that they will evict us by force,” he said. “Our concern is not over leaving this place, but we want an alternative place where we can continue our studies,” he said. Mauroof added that the LSS were planning to take their concerns to relevant authorities through student petitions. “I even strongly believe that the FSL building is not in good shape. Every day we are putting our lives at risk by going there to study. But then again the housing ministry can’t just order us to empty the place in seven days without providing us with an alternative building,” said another student. The Maldives National University was initially formed in 1998 as the Maldives College of Higher Education (MCHE). The institution was established to rationalise resources and assure the quality of all existing post-secondary government institutes. In 2011 the MCHE went on to become the country’s first university, formed under the Maldives National University Act. In November 2012, MNU announced that it would be launching the first PHD programs offered in country. The subjects offered include law and pedagogy. The university has also announced that it will also be launching programs on political science in 2013. 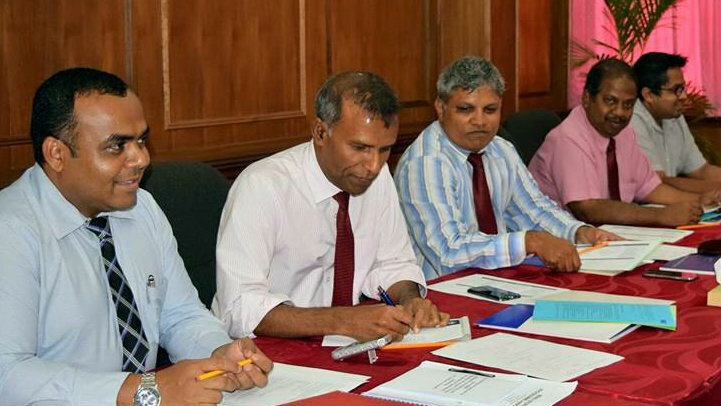 PhD programs in law and pedagogy are to be launched by the Maldives National University (MNU) tomorrow. Chancellor of MNU Fayyaz Ali Manik said the PhD positions will only be available for two or three students in the beginning. He added that two Maldivian supervisors are available to lead the PhD programs. The university currently offers a few degree courses, while other colleges in Male’ offer degree and masters course. Programs in political science are planned to be introduced by the university next year.